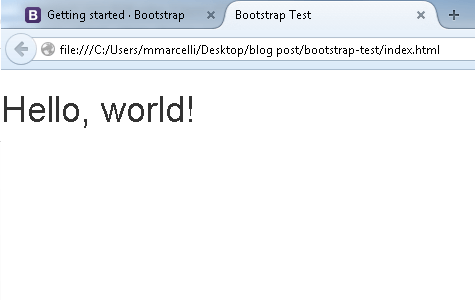 It’s not much, but you can see that the font has changed; that’s because we included, and are now using, the default Bootstrap CSS files. 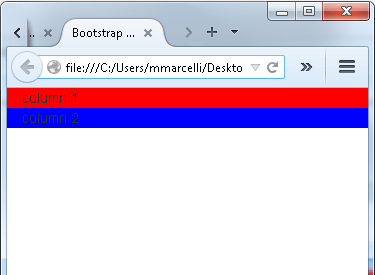 So to recap, a grid layout is built as follows: container > row > columns. For a closer look at column classes let’s check out an example. We only need to use the col-xs- class because it will flow upwards and be applied to all larger screen sizes. 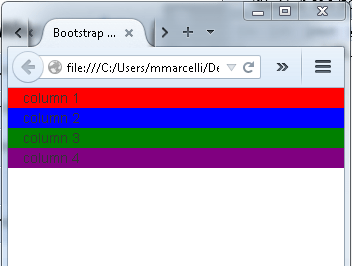 Let’s check it out in the browser, I’ve added a background color so that we can better see the column boundaries in a browser. Now what if we wanted two equally sized columns for all devices other than the smallest screen width, but we want the columns to use the full screen width when displayed on a phone? We can keep our current layout and just have to slightly tweak the classes to ensure this behavior. To take care of the full width columns we will use the col-xs-12 class on each <div>, then to ensure that the columns become equal width when the available screen size is > 768px we need to add a second class of col-sm-6. Remember, the column classes flow upwards, so that class declaration will take care of the small screen resolution AND everything above it. If you refresh your browser you’ll see that the grid layout at full width remains the same; however, if you shrink the browser down you’ll notice that the columns stack on top of each other once the resolution gets smaller than 768px. 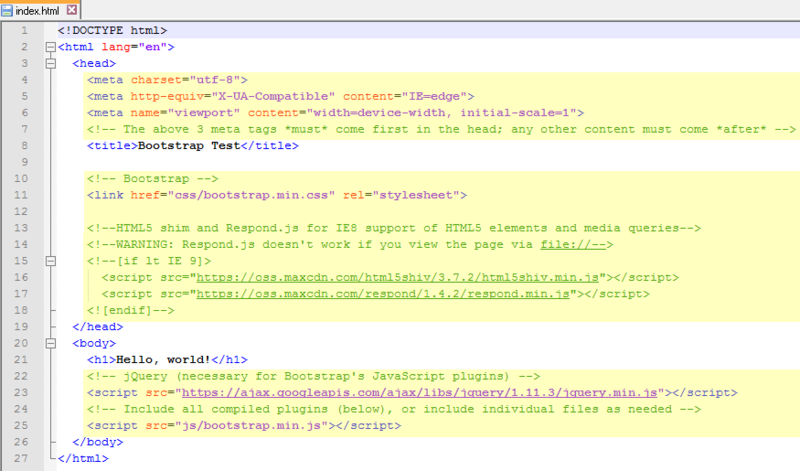 So you’re looking to create a mobile-friendly, responsive website and have decided on Bootstrap as your framework? Good move. 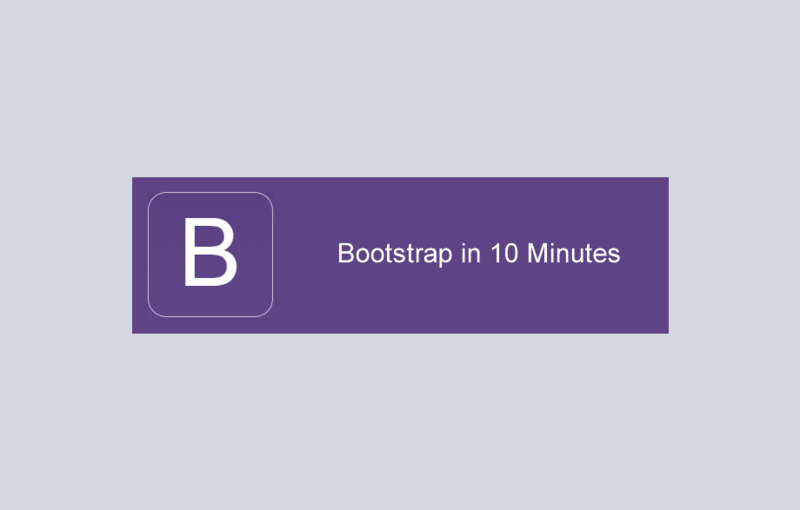 Bootstrap is one of the simplest ways to have built-in, responsive design right out of the box. 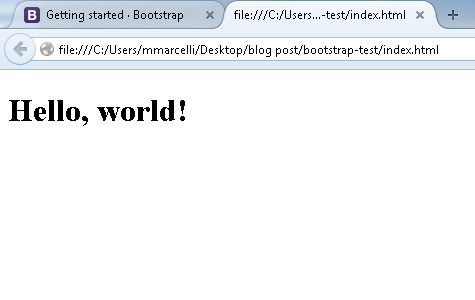 We are going to run through the steps to get a barebones Bootstrap page up and running in about 10 minutes.